Many religi ous and esoteric traditions are using the basic occult science - Astrology as a practical tool to achieve their goals. The latter, being a fully developed symbolic system, is able to find the esoteric match for any earthly object of animated or inanimate nature. Therefore, the human food, being a part of nature, can also be arranged astrologically. You can build a nutrition cycle in accordance with the Zodiac signs of different countries and territories. By the occult rules, Moon is "in charge" for the meals and their digestion. Consequently, the process of nutrition and it's basic rules can be described by the Moon cycle over the Zodiac. When the Moon is in Aries, you can visit the German pub, tasting pork legs, Bavarian sausages, drink some strong beer. Or in this time you may taste the achievements of national cuisine of Mongolia and Indonesia, also symbolically associated with the sign of Aries. When the Moon is passing Taurus, it is recommended to pay a tribute to the culinary of Ukraine and Poland, and the fanciers of exotic kitchen may like to try Egyptian and Saudi Arabian cuisine. America is ruled by the sign of Gemini. In the period, when the Moon is in Gemini, visit a fast food restaurant. We must not forget that under the control of the Gemini are also Armenia and Georgia, the culinary traditions of this countries are also very famous. When the Moon is passing through it's abode - the sign of Cancer - we should think of a distant India and it's spicy, mostly vegetarian cuisine. When the Moon enters the sign of Leo, you better arrange a feast at the Mexican restaurant, but try not to overreact with the national spices, sharp like a cactus thorns. When the Moon is transiting through Virgo, we should pay attention to the original Japanese dishes of seafood and exotic vegetables, not forgetting to eat sushi and steak from the marbled beef. For the lovers of a refined cuisine we recommend to give a visit to the French restaurant, where "haute couture" is ruling at the kitchen. Traditional English cuisine matches with the stiffness and coldness of Libra. However, if there is no desire to indulge in moderation in eating, you can taste the delights of the Czech and Swiss cuisine, characterized by somewhat more democratic views on food, and, of course, taste the delights of exotic Thai cuisine. Passage of the Moon through the Scorpio reminds us of the Arabian and Persian cuisine, with it's invariable dishes made of lamb, and, of course, the world famous oriental sweets. Sagittarius, when the Moon will enter this sign, gladdens us with an abundance of cuisines of Southern Europe, as well as brightness and originality of the Andean dishes (Peru, Bolivia, Chile, Ecuador and partly Brazil). The expulsion of the Moon in Capricorn makes us to follow a certain austerity, which is consistent with the traditional Chinese cuisine, with it's main components - rice, asparagus, vegetables, herbs and river fish. Moon in Aquarius is the best time for the sweeping and copious Russian feast with vodka, kvass, pancakes with caviar, rich soup, crumbly porridge, buns and ruddy pies, various pickles and, of course, "the queen of Russian rivers" - sturgeon. Religious sign of Pisces poses restrictions on a food quality. It is difficult to ignore Israeli kosher food (associated with the sign of Pisces). This kitchen is perfect for the fasting time. However, there are also some more democratic culinary traditions of the countries under the sign of Pisces: Finland, South Korea, Sri Lanka. Thus, it is possible for a whole month to enjoy a variety of the gastronomic delights of the world. The main thing is that you have a developed sense of proportion and no contraindications for health reasons. There is another, alternative method of determining the quantity and the quality of your meals. It is based on the analysis of the Moon cycle in relation to the position of Sun in the Zodiac. It should be noted that the Lunar-Solar cycle is one of the most ancient astrological tools. People looking at the sky, were watching how the Moon grows, moving away from the Sun, then how it is standing in the complete opposition to the luminary, and then decreasing and becoming invisible. In some civilizations, the whole life was subordinated to this astronomical cycle. Naturally, the process of nutrition was carried out in accordance with the location of the Moon and the Sun. Indications of such careful attention to the cycles of planets can be seen in many cultural monuments of Central and Southern America, as well as in Babylon, India and Iran. 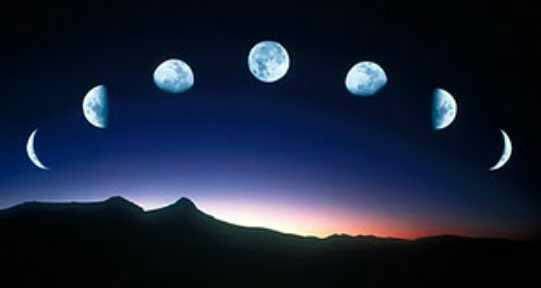 Thus, if there is a "new moon", so the Moon, parting from the Sun is in the first quarter (the angular distance from the Sun - 0 - 90 degrees). During this period, it is recommended to eat moderately, mainly in the morning, avoid fatty, fried and spicy food. In the time of transition from the first to the second quarters (angular distance from the sun 90 degrees) it is recommended to reduce slightly the amount of food. When the Moon is passing it's second quarter, rushing to the "full moon" (the angular distance of 90 - 180 degrees), it is considered possible to eat a lot and different food, giving the free rein to your culinary preferences. At this time, there were allowed all the excesses, because people are at the peak of their emotional energy, and they want to taste every possible pleasure. Then the Moon again is getting closer to the Sun, passing the third quarter (the angular distance of 180 - 90 degrees). This was the period of a decrease in the food intake. With the passage of the third quarter it is better to eat a well processed, refined food. You can try a variety of food additives and spices. 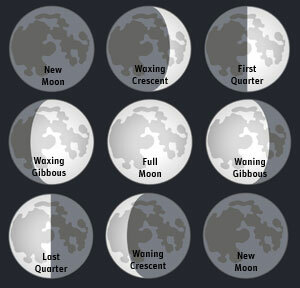 When the Moon is in the fourth quarter and disappears from the sky, getting closer to the Sun, you need to move slowly to a two-day fasting during the "new moon".